During a May assessment trip, the Guatemala Project Team continued gathering data to revamp, repair, and replace a gravity feed water distribution system for Simajhuleu, a highland village of about 2500 people. This data was then used to construct a hydrostatic model that is currently being used to design and test a system that accomplishes our two main goals: to distribute clean water throughout the village equitably while alleviating the pressure spikes that result from 700 unregulated feet of elevation change. This model has been completed, but implementation has been postponed to a later date. 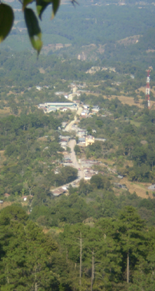 The indigenous village of Simajhuleu is tucked into the mountains three hours northwest of Guatemala City. The trip from the capital begins on the Pan-American Highway and ends on a dirt roadway that is often closed due to landslides. The remote location isolates this indigenous society both culturally and technologically. Suffering from a chronic lack of water, the village of Simajhuleu invested in a plan to pipe water from a spring six miles away to supplement their water supply. At the request of the village water board, EWB undertook an assessment trip in January 2008 to determine the feasibility of the water supply plan. An existing system had been ingeniously designed and supplied water to the village at a rate of 25 gallons per person per day. During discussions with members of the village, it became clear that this water was not being distributed equitably to the people of the village. 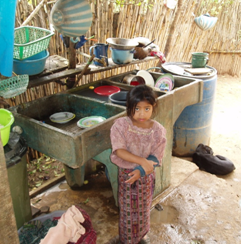 In July 2008, the Minnesota EWB chapters, along with in-country partner Long Way Home, surveyed nearly the entire 488 household village to determine the water quality and reliability. The survey found two major findings: 80% of residents stated that more reliable water was the most desired improvement to their lives, followed by an adequate water supply to the school, so their children would not have to bring water to class. The school was selected as the initial project focus. Phase 1 of the project was to ensure an adequate water supply for the 500 students attending courses each day and to provide equal water access to children throughout the village. In 2009, the Minnesota chapters designed and constructed a 130,000 liter cistern, a gutter network, and a chlorinator to harvest rainwater and provide clean water to the school. Further assessment trips resulted in the formation of three categories in which problems pertaining to the sytem would be evaluated: increasing supply in the village, addressing distribution issues, and teaching the village water conservation techniques to decrease overall water demand. Recently , project focus has concerned the village distribution system. With no piping greater than 2 1/2 inches and elevation changes up to 200 meters from tank to home, the system’s design did not meet the needs of all residents. Activities of the recent trips have involved detailed surveying and mapping of the village’s roads and pipe network, and readings of flow and pressure at various end-use locations in the village. The Implementation options, resulting from a detailed alternatives analysis completed by the University chapter, were presented to the village on a recent assessment trip. The completion of a hydrostatic model of the distribution system allowed us to evaluate various options for improving the system and to see how improvements in one location affect water flow and availability for the entire system, as well as for individual users. A full topographic map of the region was also completed using data collected on previous trips. Based on initial iterations utilizing the distribution system, an improvement scenario would involve the construction of a second mainline, incorporating larger pipe and pressure breaking tanks. These improvements would even out pressure in the system, rid the system of damaging high pressure, and allow for more equitable distribution of the water. The Minnesota chapters of EWB will continue to work to develop economically, culturally, and environmentally sustainable solutions that continue to improve the water distribution of Simajhuleu. Communication with Simajhuleu will continue to establish an order in which to prioritize system improvements and maximize resources. Design of additional storage features in the distribution system are currently being designed for future implementation to help the village cope with supply problems resulting from landslides, as well as addressing peak daily use. The team has a completed design for much of the distribution system, but due to a political turnover in Guatemala, the water distribution system implementation has been postponed to a later date. 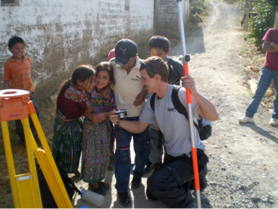 However, on a March 2011 trip to Guatemala, the team performed a routine maintenance assessment on the Comalapa rainwater harvesting system. The assessment results turned up something surprising – the community had more than doubled the rainwater catchment area. This enlarged catchment area puts stress on the harvesting system that may lead to a system failure. Discussions with the community revealed that members want this increased water source. The Guatemala team respected the wishes of their partner community, gathered needed data, and excitedly returned home. 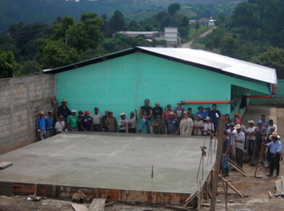 The team returned to Guatemala in August 2011 to implement improvements to the RWHS. The system is now successfully and safely in operation again. Moreover, a day of the March 2011 trip was spent in a new partner community, Agua Caliente.